★High quality aluminum body,Truly Plug & Play,does not require any software, drivers, or complicated installation process. ★Upgraded technology,powered by N-Trig Technology, improve the feel of writing. ✓100% MANUFACTURER MONEY BACK GUARANTEE：90 Days for a No-Question-Asked Refund,24h Respond E-mail Time,1 Year Warranty and Lifetime Support Guarantee. ▲The paper tab in the battery compartment is a tiny guide for changing battery, please don't rip out it. ▲Bluetooth Function is NOT included. ▲Before you buy this product, be sure to check the the compatible model you want. No Drivers or Bluetooth Connection are required. 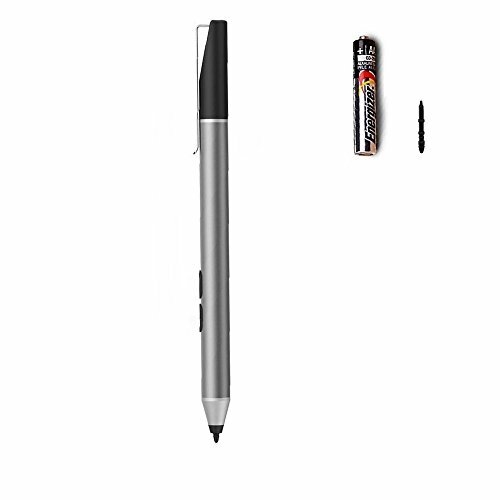 Wireless Connection,Easy to Operate.Just put an AAAA battery (included) into the pen, and then it will work perfectly. Easy storing: Book, bag or pocket - clip it and carry it anywhere.This pen is incredibly detailed and maneuver easily across the screen. Only took about 10 minutes to adapt to the functionality & you can use it enough. Drawing, writing, accessing files all comes with great ease. 1024 Levels of Pressure Sensitivity-Upgraded Stylus technology,Powered by N-Trig Technology, Provide Highly Sensitive and Precise Writing & Painting Experience.It is Perfect for Artists,Architects,Officers,Teachers,Students and Children to Write, Draw, Mark, Sign and Make Notes Anytime and Anywhere. 100% MANUFACTURER MONEY BACK GUARANTEE：90 Days for a No-Question-Asked Refund,24h Respond E-mail Time,1 Year Warranty and Lifetime Support Guarantee. If you have any questions about this product by ANYQOO, contact us by completing and submitting the form below. If you are looking for a specif part number, please include it with your message.